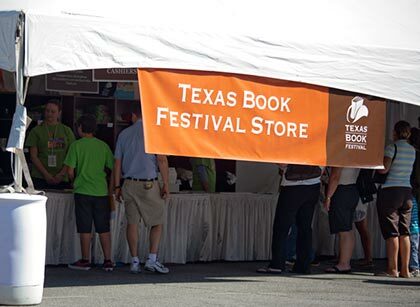 We had beautiful weather this weekend perfect for the Texas Book Festival. The first author I got to see on Saturday was Laurie Halse Anderson who was just wonderful. She was so funny and so passionate about her love of history and writing. I’ve only read two of her books but know I’ll be reading more by her. After her talk I got to hear Julia Glass whose books I’ve not read yet but after hearing her I’m definitely excited to try one. I actually do have one of her books on my shelves but you know how that goes. The most exciting part for me came next and that’s because I got to meet several Texas Book Bloggers! Jenn, Carin, Amanda, Trish, and Karen cover a wide range of bookish topics on their blogs and of course we all share a love of books. I’m only sorry I didn’t get to spend more time with them but maybe next year we can think of doing something else – a book exchange, meeting up for breakfast? I don’t know but we’ll think of something. After our lunch break we went to a book talk sponsored by Vintage Books and we got to hear authors Abraham Verghese and Courtney Sullivan talk about books and book groups. Vintage also passed out some books & totes and I got The Vintage Caper by Peter Mayle and Bloodroot by Amy Greene. On Sunday there were going to be more authors but I only went to see Justin Cronin talk about his book The Passage. I’ve not read it but of course I really want to now. So, all in all a fun event. Oh but can you believe I didn’t buy any books. None. Maybe it was the heat that affected me after all. Ha. I do have a lot of new books to tell you about but I’ll save that post for tomorrow. I’m glad you had fun at the book festival, Iliana! And meeting up with book bloggers, double wow! Speaking of the heat, we’ve been getting those hot weathers over here lately too. Melody – It was such a treat to meet them. Turns out Carin and I live close by so we are already talking about getting together for more book talk 🙂 I’ve got a lot of ARCs lately and some look so good so I can’t wait to tell you guys about them! Hope you’ll make it to Thrill Me! group in November. It’s a fun group and we’re pretty laid back. I didn’t realize that you went to Laurie Halse Anderson’s talk too! I kind of wanted to go, but I hadn’t read any of her books and she’s so popular that I figured it would be better to skip it (I felt like a pretender in Cronin’s and Adichie’s events since I hadn’t read them either!). I also wanted to go to a Medical Mysteries talk when Anderson was speaking. I only made it for the last 10 minutes…sad! Anyway, it was so fun meeting you this weekend! Hopefully we can get together for coffee or something sometime! I loved that Cafe Medici coffee and want to go to the actual cafe sometime. Maybe we can meet there and talk about a book we both read or something! i am so envious. You got to meet some awesome authors. I am impressed that you didn’t buy any books. You definitely have more will power than I do. It sounds like you had a far better time than I did! I loved meeting with all of you, but I missed every single panel I went to and spent most of the day standing or sitting around in the heat, and then Jason’s iphone got knocked out of his hand and shattered. We spent the evening at the Apple store getting it replaced instead of going to the zombies vs. unicorns panel. Sigh. I definitely think the TX bloggers need to get together sometime outside the festival! vivienne – I can’t believe I didn’t buy any books either. I think the problem is that you’ve got to run to your next author talk so it’s either get a book or see an author! Haha… They do have a lot of tents with books and such but at the end of the event I was getting tired, hot and thirsty so I ended up leaving. You are so lucky that you got to see Laurie! I would love to do that! Yep, this is me — so jealous!! I haven’t read The Passage yet, but of course, I’ve heard so much about it, that I’m kicking myself for not having read it sooner!! Sounds like a great day!! What a wonderful weekend you had! Call me envious! That’s so neat that you all got to meet up! And I’d love to see Laurie Halse Anderson. Lucky you! Sounds like a great experience! It is really nice to have had the opportunity to see some of the authors in person, hear them talk about their books, and form a closer connection. What fun. We don’t have anything like that here, but I’d love to hear authors speak about their work. Good for you to resist the temptation of buying new books! Willa – She was really great. I just wish I’d had time to get a book signed by her. That would have been quite a treat. BuriedInPrint – I have a confession to make. I had sort of resisted Glass’s books because I thought they might be “old-fashion” and not in a good way. Like maybe a bit preachy? I don’t know where I came up with that idea. But, after hearing her she was just so charming. I must read one of her books and I love a great rich character so I don’t think I can go wrong now! Coffee and a Book Chick – I felt like I should have read it to follow some of the discussion. I was worried someone was going to spoil the end – haha…. It looks really good but it is a big, thick book and I think I need to be ready for it! haha. Stefanie – It was so fun. I have always wanted to meet book friends and this was perfect. Now if we could all get together can you imagine what a blast that would be? jenclair – It really is. Some of the authors really surprised me too – for example Verghese who is a doctor, I just assumed he wouldn’t be as personable but he was funny and so interesting. Filled with envy. There’s no book-stuffed brain like a Texan’s book-stuffed brain. I wish I’d hired an airplane to fly over the festival trailing a banner with my title on it! I really enjoy book festivals but can never do everything I want. And a little jealous you saw Laurie Halse Anderson. I really wanted to go to her event but we didn’t leave Dallas early enough. Hopefully we can all get together again!! Trish – I loved that book Amanda got. It is so cute! Next time we must plan better so we can spend more time chatting about books and Carin and I were thinking of doing a book exchange or something fun like that. Or we could have a field trip to BookPeople 🙂 I’m already looking forward to our next get together! Wow, sounds like you had a great time! It sounds like you had a great time (and perfect weather!). Lucky you! I’ve read one book by Julia Glass (Three Junes) and really enjoyed it. I have The Passage and The Summer Guest (Cronin) in my stacks and can’t wait to read both. Keeping fingers crossed that I can attend next year!